It seems like everyone is launching a product online these days. Ironically, most of the products launching are training programs teaching you how to launch a product. It seems a little Seinfeld to me. Nevertheless, if you follow the tips I outline here, you are more likely to enjoy a successful product launch of your own. So where do you start? Here of course – with the problem your product will solve and for the specific person that has the problem. * Who is your target audience in your niche? * What problem do they have that you can solve? * What knowledge, skills and experience do you have that can help other people? * Who needs your solution for their problems. Either way you must have the capability to solve a problem that someone has. Before you spend all of your time, energy and money developing your product, you must first engage with your prospects and find out if your solution has any traction. Now that may seem to be an obvious thing to do, but when you see the many hundreds of desolate online training programs and membership sites scattered throughout the internet, you will witness the failure of their creators to engage with their intended customers from the start. The lesson here is that if you build it, they will not necessarily come. However engaging your prospects right from the very start will not only provide you with valuable feedback, but will also give your prospects a sense that they are part of the process and will be more likely to purchase the end product. Long before the internet, there lived the long-form sales letter. This was basically a printed advertisement around 8 to 12 pages long. If you managed to get to the very end, you were well and truly broken down and ready to submit your credit card details. With the introduction of the internet, the online version of the long-form sales letter was even longer, without the limitations printed paper. More recently, the sales letter has morphed into a long sales video – usually around 20 to 30 minutes long. These sales videos were embedded on a standalone landing page giving the prospect the only option to buy the product or leave the page. Today, the 12 page sales letter has been replaced with the 12 day product launch. This has been made popular with Jeff Walker’s Product Launch Formula which uses the power of storytelling to pull the prospects in using three videos. This increases the number of contact points with prospects and allows two-way conversation to create an event and build anticipation for the Launch. 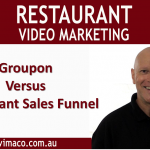 The series of videos delivers real value to the viewers and build a relationship before asking for a sale. (What’s In It For Me) rather than what YOU are selling. Always focus on the end benefit. What impact will your product deliver to your prospect? What problem do you solve? What is the transformation that you offer? This is usually a change of lifestyle from working 9 to 5 for your boss, to having your own online business, and working when you want. Remember, you’re selling holes, not drills. Video One should let your audience be aware of another video coming out in a couple of days with more great content as this build start to build up the anticipation. Always end the video with a Call to Action for your viewers to leave their comments below the video using social media plugin, usually Facebook. This creates social proof and a sense of community. And more importantly, it allows you to have a conversation with your prospects, answer any concerns they have and build trust. In second video, start by thanking them for their comments and give a quick recap of the first video and remind them why they should be listening to you. This is important as they will be some viewers who did not see your first video. Show the audience what is the opportunity that your product offers and how it will transform their life. Once again you need to deliver more valuable content that they can use right now. Get your prospect to see themselves benefiting from the product. When they truly believe they will get the results from your product, they will buy. In the final video, you will need to overcome any objections by answering the Top 5 questions you have been receiving. Follow that up by showing what your product will do for your prospect by projecting in the future. Tell them what they need to do now and unveil your offer. Now add some scarcity such as a time limit when the cart will be open, or when the price will increase. A significant amount of purchases will be made just before the deadline so it does work. Using the 3 video formula allows you to build trust using the consistency of the 3 video sequence. It also helps you to use other social triggers such as authority, reciprocity, anticipation, community, social proof and scarcity. These are all powerful, hard-wired triggers that help persuade your viewers to purchase your product. Good luck with your own Product Launch.